We knew 2016 would be a very strong year for US solar, but we didn’t expect it to be this strong: In its biggest year ever, solar installations grew by 95% over 2015! 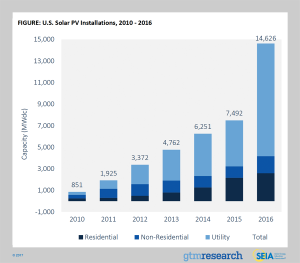 A wonderful 14.6 gigawatts (GW) of solar PV were installed – compare that with 7.5 (GW) in 2015, which until now, was also a record, says GTM Research and the Solar Energy Industries Association (SEIA). Total solar PV in the US has reached 1.3 million installations – a total of 40 gigawatts – in an industry that employs 260,000 people. And this all happened during President Obama’s tenure. Read our articles, Will US Give Up Great Gains Made on Renewable Energy? and , Knock, Knock, Are You Aware the US Can Run on 100% Renewable Energy? In five years, the US is expected to reach 105 GW, according to Bloomberg New Energy Finance. For perspective, both China and Europe have over 140 GW as of 2015. “Ten years ago we thought hitting even a 25% wind-penetration level would be extremely challenging, and any more than that would pose serious threats to reliability. Now we have the ability to reliably manage greater than 50 percent. It’s not even our ceiling,” says Bruce Row, Vice President of Operations for Southwest Power Pool. And to those who still insist we can’t grow the economy and protect the environment at the same time: US GDP is up 12% since 2007, while energy consumption is down 3.6%. 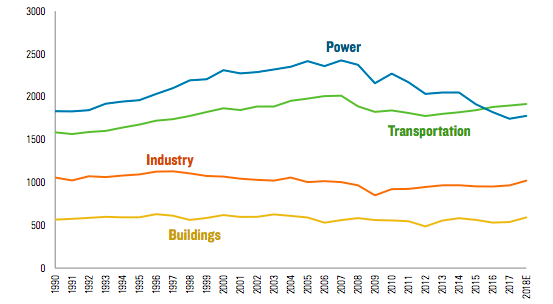 “In other words, energy productivity continues to improve as less and less energy is needed to fuel growth,” says the 2017 Sustainable Energy in America Factbook. Lower energy demand combined with more renewable energy use means US greenhouse gas emissions are down – hitting 1994 levels in 2016 – 12% lower than 2007. Emissions from power plants dropped 5.3% in 2016, bringing the most polluting sector in the US 75% of the way toward meeting President Obama’s Clean Power Plan target – which Trump is about to repeal. The Factbook also points out that Americans are spending under 4% of total expenses on energy, the lowest EVER. How did this happen? Because of great gains in energy efficiency (ie. cars use much less gas; appliances and buildings use much less electricity), more renewables on the grid and low gas prices. All told, over 3 million Americans work in clean energy. As we all know, all these advances are threatened by the Trump Administration.